I forgot the exact time I decided to postpone my reading of Ludwig von Mises' "Socialism: An Economic and Sociological Analysis". After watching a youtube video that the leading presidential candidate was a self-confessed socialist and after stumbling with few Facebook status updates advocating socialism, they motivated me to delay no longer my reading of Mises' book. 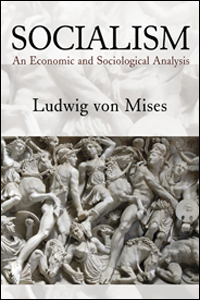 Digesting Mises' book on socialism is vital to have an informed understanding of the conflict between socialism and capitalism. I don't want to follow the example of what Mises describes as "irresponsible babbler" who publicly talks and writes a lot about capitalism and socialism without familiarizing himself with what the economists have to say about these issues (Ludwig von Mises, "The Anti-Capitalistic Mentality," 2008, p. 47). Mises' book on socialism has a credible reputation to have refuted the socialist paradise. The author argued that the central weakness inherent in socialism is the impossibility to have a sound economic calculation and planning due to the absence of price system. As such, socialism will inevitably lead to waste of resources and poverty. "Thus about the middle of the nineteenth century, it seemed that the ideal of socialism had been disposed of. Science had demonstrated its worthlessness by means of strict logic and its supporters were unable to produce a single effective counter-argument. "It was at this moment that Marx appeared. Adept as he was in the Hegelian dialectic - a system easy of abuse by those who seek to dominate thought by arbitrary flights of fancy and metaphysical verbosity - he was not slow in finding a way out of the dilemma in which socialists found themselves. Since Science and Logic had argued against Socialism, it was imperative to devise a system which could be relied on to defend it against such unpalatable criticism. This was the task which Marxism undertook to perform. It had THREE LINES OF PROCEDURE. First, it denied that Logic is universally valid for all mankind and for all ages. Thought, it stated, was determined by the class of the thinkers; was in fact an 'ideological superstructure' of their class interests. The type of reasoning which had refuted the socialist idea was 'revealed' as 'bourgeois' reasoning, an apology for capitalism. Secondly, it laid it down that the dialectical development led of necessity to Socialism; that the aim and end of all history was the socialization of the means of production by the expropriation of the expropriators - the negation of negation. Finally, it was ruled that no one should be allowed to put forward, as the Utopians had done, any definite proposals for the construction of the Socialist Promised Land. Since the coming of socialism was inevitable, Science would best renounce all attempt to determine its nature." Source: Ludwig von Mises, "Socialism: An Economic and Sociological Analysis," 1951, pp. 15-16. What do #Filipinos think of drug decriminalization? How Could A Strong Executive Power Be Checked And Balanced By An Agreeable Turncoat-filled Super Majority?